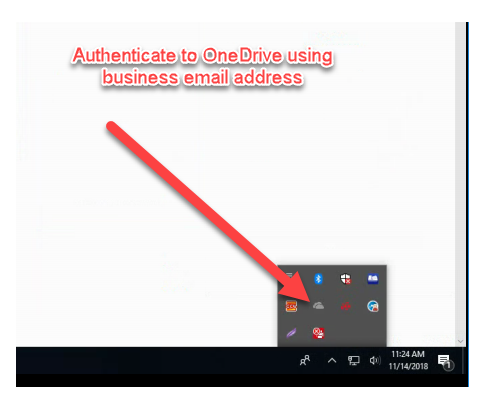 This post provides a basic understanding of OneDrive and SharePoint’s features in the workplace and how to get up and running today. It’s pretty short and sweet but it should get your employees and business going. Note: Make sure your business subscribes to Office 365 before diving into this topic. 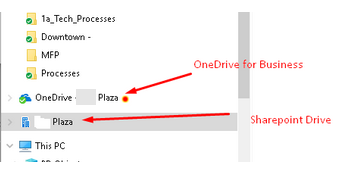 Step 1) Click on OneDrive if it’s greyed out on the system tray as illustrated below. 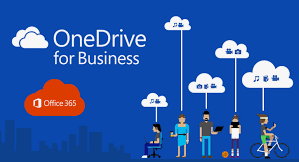 Signing into the OneDrive application activates a personal drive for your business professional email account. Think DropBox but Microsoft version of it. Step 2) View and learn the difference between SharePoint and OneDrive as illustrated below. SharePoint gives you access to the communal drive or the network share drive. Your team can edit and collaborates on various files and documents when SharePoint is activated. This reduces the back and forth emails with file attachments among your peers. SharePoint does not work unless you first sign into OneDrive. OneDrive contains a blue cloud icon and SharePoint contains a building icon. Step 3) SharePoint may not be activated on your Windows profile yet if it does not show up in your File Explore. You are ready to go if you see SharePoint as illustrated above. However, keep reading if you are missing the buildings. Step 4) Head to http://portal.office.com and click SharePoint to view your team’s site that will allow you to “sync” the communal share and view the building in your file explore. This SharePoint setup if not activated is a bit a mess; and has yet to be perfected by Microsoft 365. The more convoluted SharePoint instructions are provided here. Otherwise, contact your IT support team for further details. This is just one feature of Microsoft 365 suite of products. We will add more helpful links in the near future.